Exploring the way our choices and relationships are shaped by the menace and beauty of the natural world, Megan Mayhew Bergman’s powerful and heartwarming collection captures the surprising moments when the pull of our biology becomes evident, when love or fear collides with good sense, or when our attachment to an animal or wild place can’t be denied. In “Housewifely Arts,” a single mother and her son drive hours to track down an African gray parrot that can mimic her deceased mother’s voice. A population-control activist faces the conflict between her loyalty to the environment and her maternal desire in “Yesterday’s Whales.” And in the title story, a lonely naturalist allows an attractive stranger to lead her and her aging father on a hunt for an elusive woodpecker. 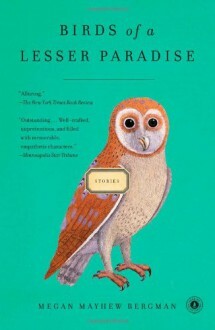 As intelligent as they are moving, the stories in Birds of a Lesser Paradise are alive with emotion, wit, and insight into the impressive power that nature has over all of us. This extraordinary collection introduces a young writer of remarkable talent.